Let me say first that I understand this is really a night-time joint. And let me admit that I haven’t been at night; I’m too old for trying to have dinner over the din of the cocktails crowd, and way too much of a vinyl-head to put up with having the soundtrack to my night piloted by prepubescents fiddling around with those dreadful MP3 decks they insist on using in bars these days. But yes, it’s probably better at night and my review should be discounted appropriately. However, like a teenager, this bar come restaurant does eventually get up, open the blinds and assess the damage. And there is really something distinctly of a hangover about its daytime service. It’s a touch slow, lacks finesse, and still wears that ‘you have no idea what you missed’ sheepish grin on its face from the night before. But I digress. What about the food? I should start upfront by saying that I’m not personally in love with this restaurant. Now, it’s not bad by any means, but it also doesn’t quite work as a daytime place for me. In many ways I actually prefer MOMO, it’s mother restaurant closer to the park, which does very similar food but somehow feels more the part. Having said that, neither are exactly destination eateries unless your major motivation in life is to pay NYC prices for ok-ish fusion Japanese food, in Holland. This was our second trip, and after the first in which I really didn’t think much of it, I honestly wanted it to be great. It just isn’t sadly. I’ll get the negatives out of the way first and then let’s try to end on what it does well. We gave it a good go and ate the whole tasting menu. A 7 tapas-course lunch and two glasses of fizz came in at over 200 Euros. Just to give some perspective, you can eat at the best 2 Michelin star in town and pay roughly the same. Yes sure it was the full tasting menu, and sure there was wagyu involved, but 230 euros is truly idiotic pricing for a lunch at a restaurant of this mediocre caliber. Having been presented with this bill, which I’d wager is probably 30% too expensive, I almost had to beg to pay. We sat for 10 mins at the table, card in hand, coffee finished, waiting for someone to let us inflict serious damage on our bank account and get out of Dodge. Not being allowed to pay at the end of a meal is one of the things truly guaranteed to make my blood boil, no matter how good the food is. Eventually we gave up waiting, got up and stood by the bar until they let us out. The menu is peculiar. Its absurdly long (I counted 92 dishes), and the more ‘fusion’ it gets, the more you suffer. The tasting menu is deeply frustrating. It starts fabulous then leads you on a sorry downwards spiral from really good food to just ‘pffff’. Occasionally another good dish pops up, but that just compounds the frustration. Given this is a tasting menu perhaps we can extrapolate to say that maybe 2-3/7 of the dishes on the greater menu are actually ok. So why don’t they just concentrate on those ones and drop the rest? It would still leave them with 20-30 plates, which is more than enough choice for anyone. Indeed part of the reason we choose the tasting menu was we were hungry and didn’t fancy spending half an hour deciphering the encyclopedic offering before we got to eat anything. Our waiter just left us alone with the menu for 20 mins… perhaps they just got so used to people sitting there not knowing where to start, that they just give people half an hour to work out what to order as standard now. The menu itself opens well enough with an extremely delicious plate of of sashimi. This is a triumph of well sourced fish, well prepared, and served simply with attention to detail. Slightly too cold for my taste, but it was well garnished and given interest from fresh wasabi…a great little dish. We beamed at each other. Wow, maybe we just unlucky last time we ate here. Maybe I just wasn’t into it as I was feeling a bit sick. Hey, maybe its a really solid restaurant! Not so much. 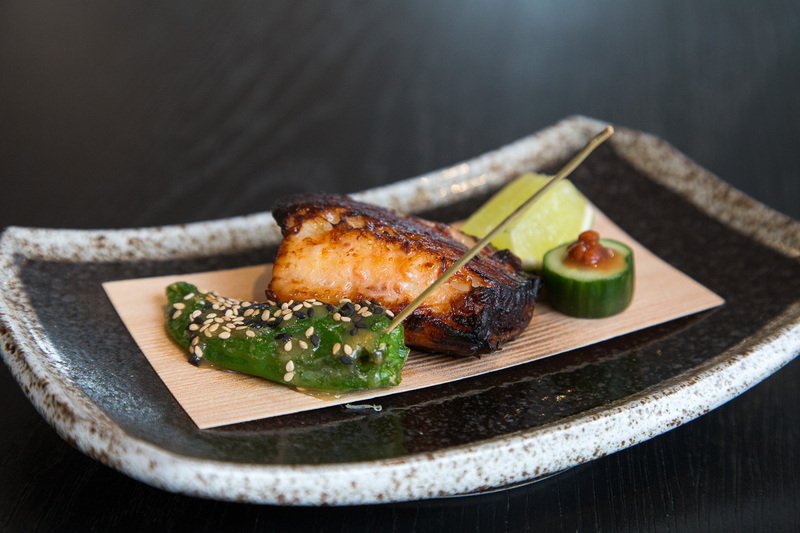 The next dish knocked us squarely back on our heels. Sea bream ceviche with grapefruit, avocado, fennel salad, and little nuggets of spiced dried corn. The fish was unrecognisable amidst the garnish and everything was drowned out by huge segments of grapefruit. A very poorly conceived, overly busy, dish. Nadya was half through the dish, shaking her head and pushing the plate away. The Dr Jekel and Mr Hide theme continued as two preparations of scallop appeared. One highly spiced and one with a yuzu truffle sauce. The first worked and was nicely offset with a crunchy little garnish, while it’s truffled friend fared decidedly less well. 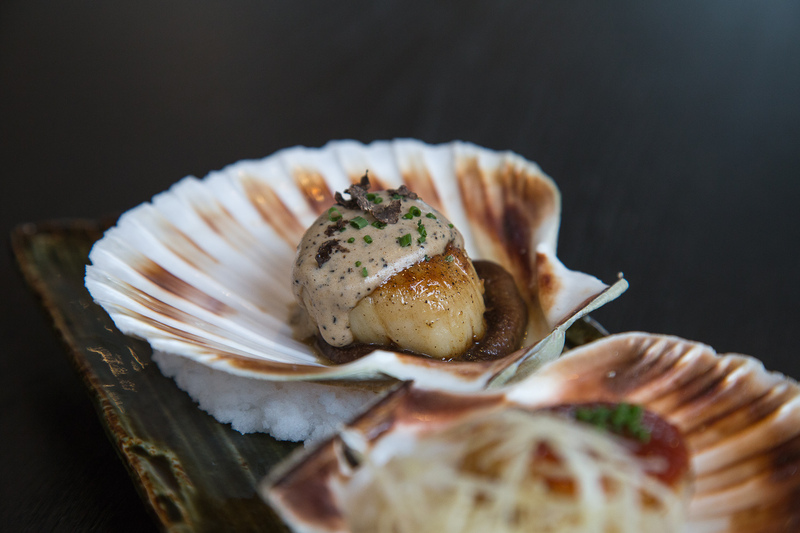 Truffle cream sauce with a scallop – I don’t think that makes much sense unless the aim is decadence at any cost (including good taste). Sadly the rollercoaster came crashing down again as the main course cane out. 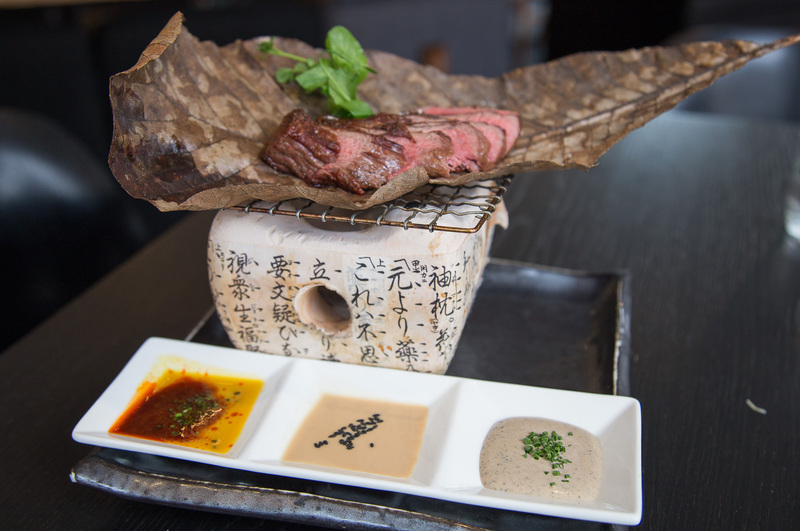 Wagyu steak with varied dipping sauces. The steak itself was cooked ok, medium rare, though had they bothered to ask how I wanted it cooked, I most certainly would have had it rarer. It was ok at best. The sauces were oddly balanced when eaten one after another and generally overpowered the delicate wagyu individually. It was served on a non-lit Japanese BBQ, upon a huge dried leaf. The presentation pretty much summed up the meal to me. Pretentious, happily superficial and lacking any substance. By the time the passable sushi course came out I must admit I was past caring. It was OK. A nice selection of fish with an interesting, not overpowering, fusion garnish. The less said about dessert the better. A truly godawful chocolate mouse that tasted like it had been made with silken tofu, served with a random fruit salad. A chocolate spiral had been stuck to the top and printed with the restaurant’s logo as if it were some aspirational brand. I didn’t bother to take a photo. And there ended a very disappointing meal which showed some real promise but was quickly drowned out with a huge wave of pretension and bad service. It would take quite a lot to get me to come back here.